Few Days Before Facebook Released new Layout of Profile Page. 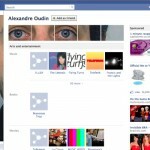 Now Many Users Creating their own ideas to Decorate their Profiles by New Facebook Profile. These Pages are Really represents the Good Creativity of users in Facebook. now Facebook not only increases friends even creativity too.